Although bathrooms shouldn’t be small, they invariably are. Building designers believe that despite all the stuff that you have to cram into them, bathrooms should be as bijou as possible, with just enough space to close the door behind you when you go to the loo. For most of us who don’t live in luxury mansions, it’s just something that we get used to and learn to live with. But that doesn’t mean that our bathrooms have to lack impact. Absolutely not! There are loads of ways that you can use accessories to bump up the wow factor in your bathroom and leave your guests stunned. Take a look at these ideas and start using them in your bathroom today. Most shower curtains are, at best, fairly mundane. They’re pieces of semi-plastic sheeting held in place, if you’re lucky, with a pair of hooks at either end of the bathtub. More often than not, they’re also covered in a nice thick layer of black mold to help you feel extra special in the morning. But it doesn’t have to be that way. Not at all. Adding a shower curtain valance helps to make your bathroom feel more like a luxury hotel than something you’d find in your home. It adds an element of luxury to a tired bathroom and can be customized in any way you like. 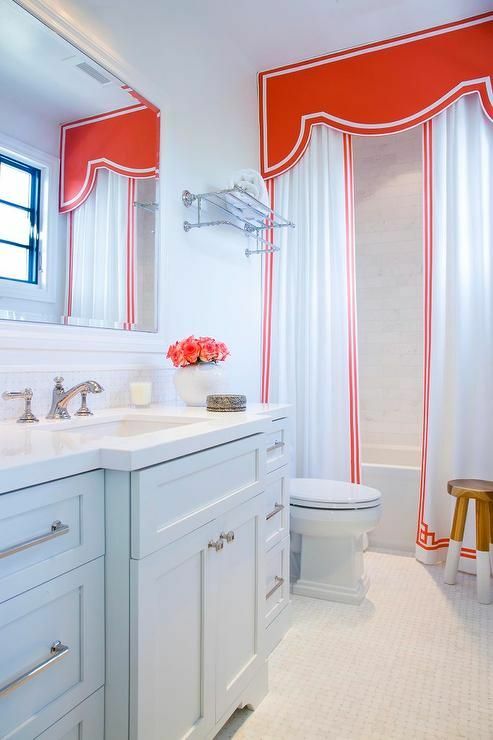 The most extravagant shower curtains come with bold patterns which match the valance above. People are often pushed for space in their bathrooms and struggle to find places to put big, bulky things, like towels. But with the help of overhead storage, that problem can be consigned to history. Overhead storage helps to free up space below both for decorative objects and well as moving around the bathroom, unimpeded by cabinets. You can also use overhead shelving to house decorative objects. 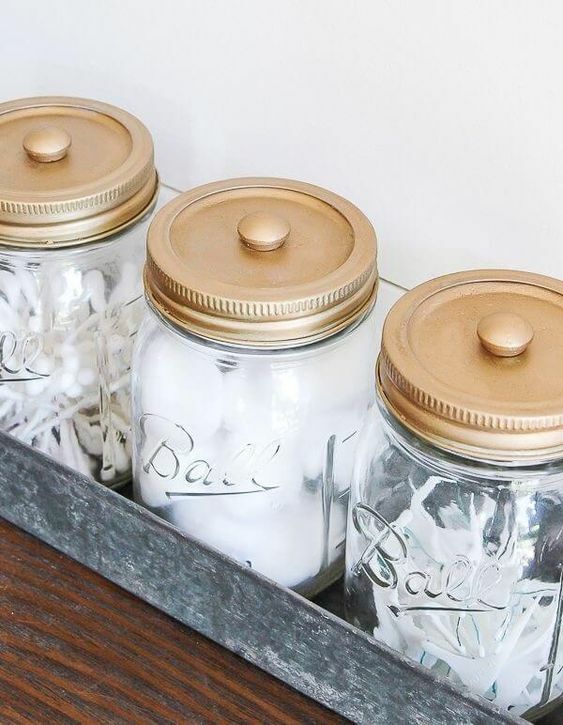 You could include mason jars filled with soap, candles, or ornaments. Just make sure that the style of your overhead shelving matches the rest of your bathroom and that you have the headspace to move around without knocking into them. Go down to the DIY store, and you’ll find a plethora of very dull looking towel hooks made from either white plastic, or if you’ve got a higher budget, plated metal. As bathroom accessories go, they’re not particularly inspiring in general. 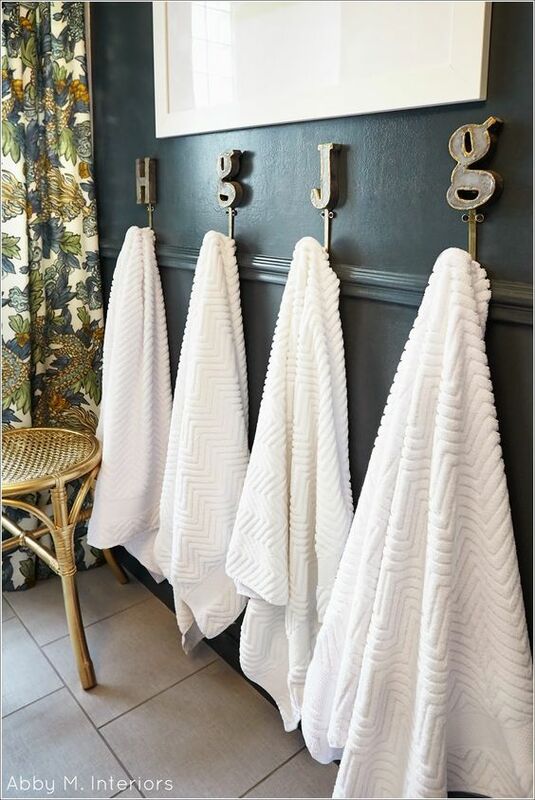 But that doesn’t mean you can’t find some towel hooks that make a statement. The great thing about towel hooks is that they’re simple objects you can fashion out of materials you can find around your house. 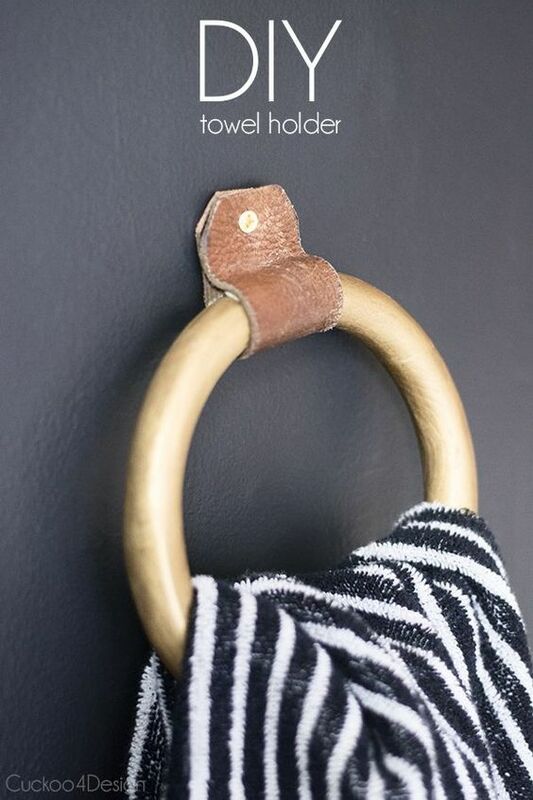 So long as you’ve got a hammer, some screws, a screwdriver, a saw and a paintbrush, you can make just about any kind of towel hook imaginable. Bespoke towel hooks are particularly great if you want something which matches the rest of your bathroom decor. Just make sure that whatever you come up with doesn’t protrude too far from the back of the door or the wall: you don’t want to impale yourself. If you’ve ever spent time looking through a glossy interior design magazine, there’s a good chance that you’ll have come across the use of ladder racks. Ladder racks are popular because they fit neatly against the wall, they look stylish, and they produce an airy, light effect when installed in a room – entirely different for regular shelving or cabinets. It should come as no surprise, therefore, that they work well in the bathroom. 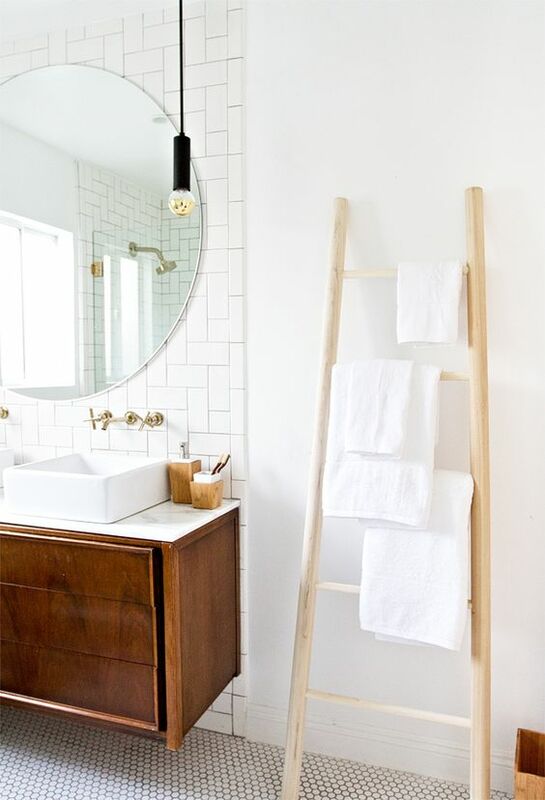 You could theoretically use a bathroom ladder for anything, but they lend themselves particularly well to the neat storage of towels, allowing them to hang in a way that lets them dry out, without making it look as if that’s their sole purpose. The other great thing about ladder racks is that you can easily make them yourself out of – you guessed it – an old wooden ladder you might have hanging around. Just give the ladder a sand down, and a fresh lick of paint and you’re good to go. If there’s one thing that people notice when they enter a new bathroom, it’s the fixtures and fittings, particularly the shower head. Excellent shower fittings, as this chunky article points out, can add an element of sophistication to a bathroom. 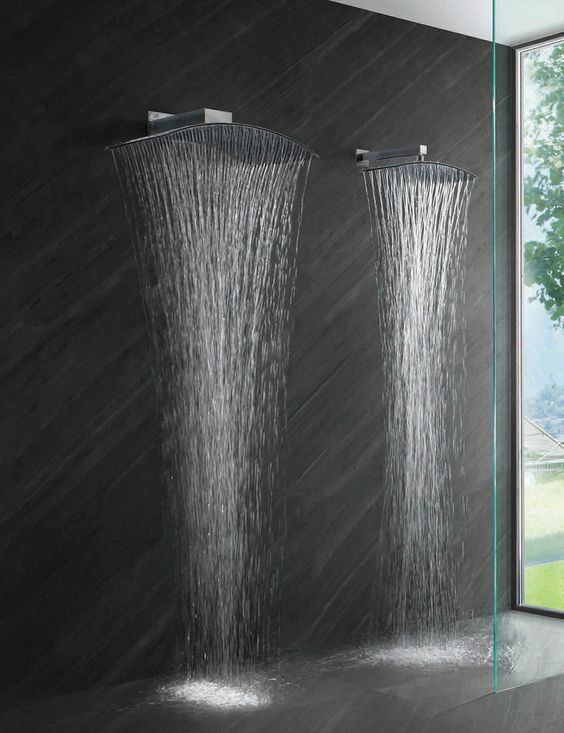 Choose a shower head which matches your overall theme and then think about which particular model best fits your needs. Mason jars are most often used in the kitchen or garden for stylish effect, without serving any practical function. But that doesn’t have to be the case in the bathroom. 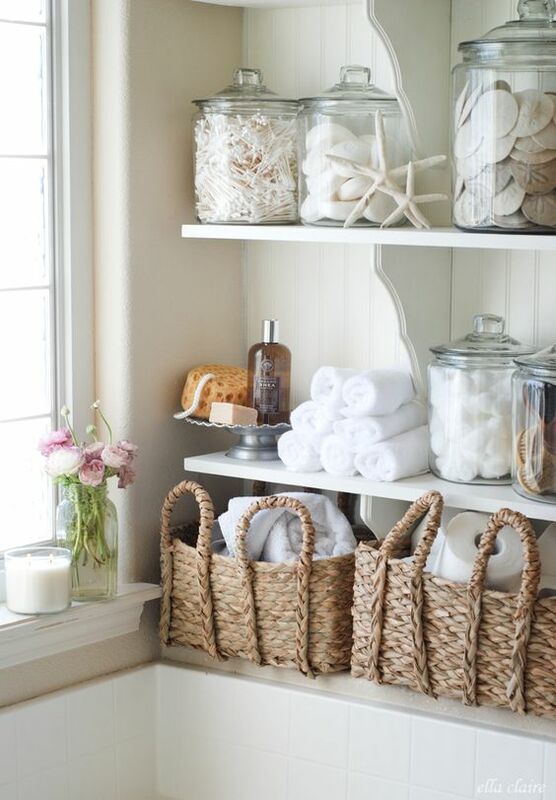 You can use mason jars for all sorts of things, like storing toiletries. You can also decorate the outside in any way you like by hand. Lacing them with white, glittery material can look exceptionally good if you’re going for that luxe look. Regular towel racks tend to be boringly functional. Even designer racks can lack any sense of flair or originality. It’s best to do it yourself when it comes to hand towel racks; otherwise, you’re likely to wind up disappointed. One idea is to use an old metal wine rack that you might have lying around. Metal wine racks are excellent bases for hand towel racks because they provide the perfect opportunity to store towels rolled up, just like they would be in a hotel. Okay, sure, you’ll have to roll them up again before guests arrive, but there’s no denying that converted wine racks look good as towel holders. Once you’ve painted the stand to match the color of your bathroom, embellish it by surrounding it with a beautiful tissue box and potpourri. 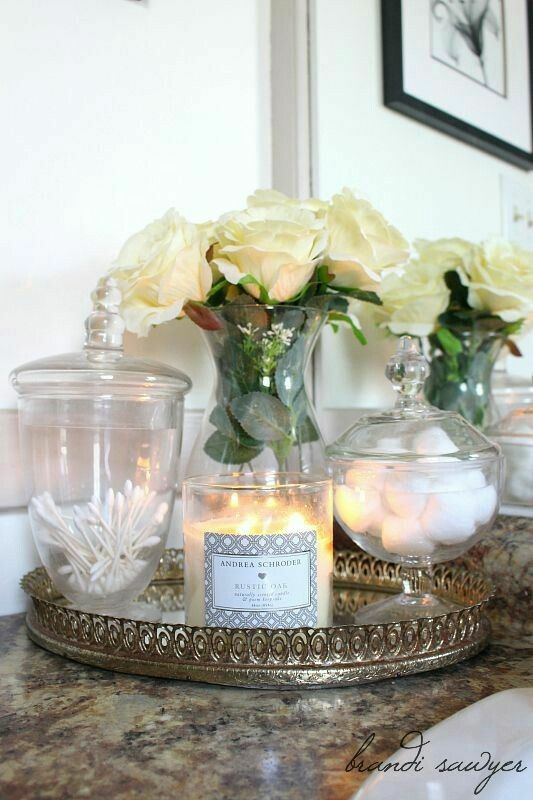 If you’ve got a lot of objects that just sit on your bathroom counter, like mirror, towels, candles or indoor plant pots, then the whole thing can look a little messy, especially if you’ve just used the bathroom. But using a tray, you can unite these wayward objects, helping to bring everything together. So-called “statement trays” are popular right now because not only do they bring objects together, but they can also be beautiful in themselves. 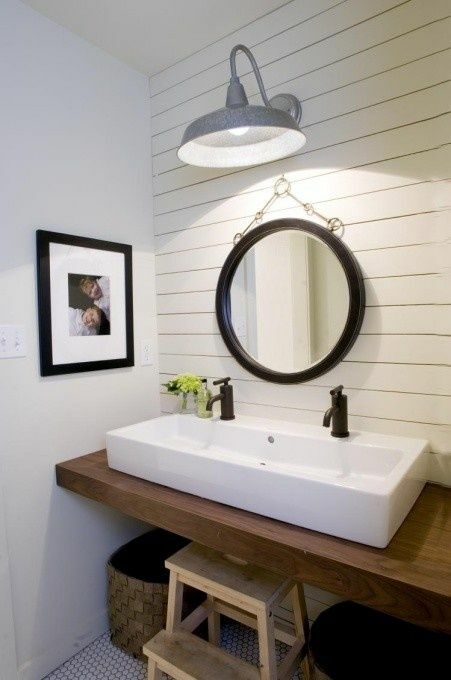 Wooden trays, particularly, tend to work well with marble and quartz surfaces so often found on bathroom counters. Although Mason jars have their place in the bathroom, there are some things that they cannot do, such as provide storage for dozens of bars of soap, for instance. That’s where glass apothecary jars come in: you can use them when you need to store a lot of stuff in an attractive way. Sure, you can use them to store soap, but they also lend themselves well to the storage of potpourri and anything else that you want to make pretty. Trough sinks are not common at all, and the perfect way to make your bathroom stand out from all those with pedestal sinks. Trough sinks are precisely what they sound like: long sinks that run along the wall with multiple tap fittings, allowing two or more people to use them at once. They are supported by pedestals running underneath and look great when finished with nickel or brass faucets. 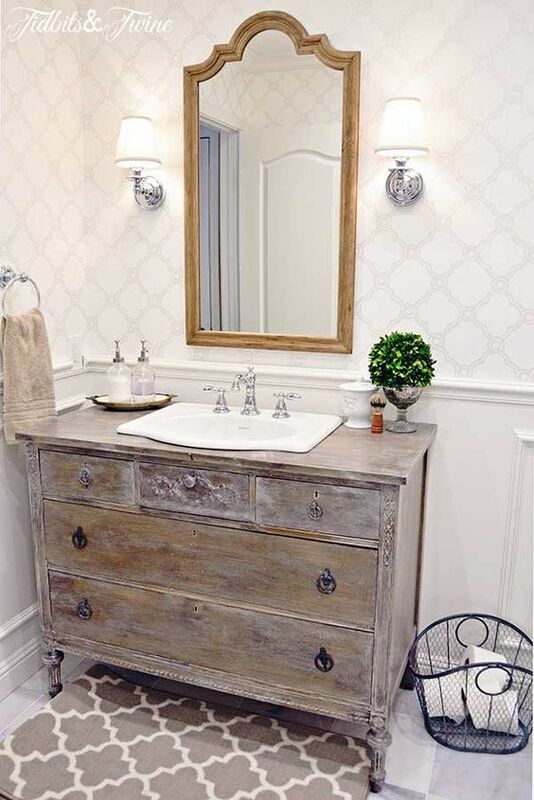 Finally, if you have space in your bathroom, get a vanity dresser. Vanity dressers, especially antique varieties, often come paired with sinks, allowing you to use them in place of whatever sink you currently have. Look for hardwood dressers made from oak, cherry, or ash. Previous articlePregnancy Eats Around the World: To Eat or Not to Eat?